Will the madness ever stop? 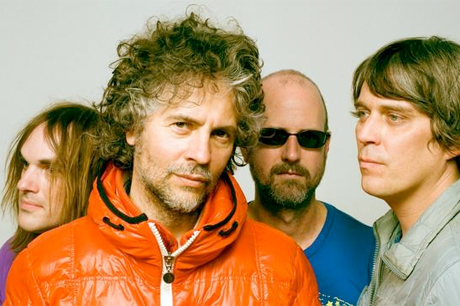 It seems as if every time we hear from the Flaming Lips, the beloved psych rockers are cooking up a crazy new scheme. In recent times, this has included marijuana-flavoured gummy skulls, gummy vaginas and fetuses and a song that requires 12 synchronized mobile devices to listen to. Now, frontman Wayne Coyne has hinted that the group have a bizarre new project in the works: a six-hour-long song. Today (August 29), Coyne tweeted, "Takes a long time to make a 6 hour song...................."
He also posted a pair of videos containing what appear to be clips of the band working on the track. Both videos are below, but you can't hear much of what this tune's going to sound like. In case you're doing the math at home, this song will be only slightly shorter than the Flaming Lips last seven official LPs combined (not including their Dark Side of the Moon cover album). UPDATE: The six-hour song is very much for real. In fact, if you head here and donate $100 to OK Humane Society and [email protected], the Lips will sing your name in the song. Thanks to Prefix for the tip.